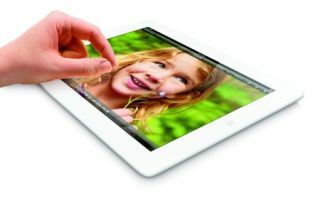 Apple launches new iPad 4 - iPad 3 removed from Apple store | What Hi-Fi? Apple announced a brand-new iPad at the iPad Mini event and in so doing consigned the last-generation iPad, the iPad 3, to the scrap heap. The new iPad - already being called the iPad 4 - features the same 9.7in Retina display but an all new Apple A6X chip. The new A6X processing chip promises twice the CPU performance and twice the graphics performance of the last-gen A5X chip. Apple has added the Lightning connector to the new iPad, a FaceTime HD camera, faster WiFi speeds thanks to support for 802.11n and the addition of 4G LTE support. The Apple iPad 2 is now cheaper, too, at £329 for the 16GB WiFi version and £429 for the 16GB WiFi and 3G. The iPad 4 still has a 10-hour battery life and the same dimensions as the previous iPad. The iPad 3, released just six months ago, has however been removed from the Apple store and replaced. The iPad 2 continues. You can pre-order devices from Friday 26th October and shipping for the new iPads starts on Friday November 2nd. Free exchange for your 'old' iPad 3? And there are suggestions that if you bought an iPad 3 in the last 30 days, Apple might swap it out for a new iPad 4. Cnet reports some stores in the US are telling customers they will exchange mint condition iPad 3 tablets for the new iPad. As yet, there is no official word from Apple or on whether this will be the case in the UK but it looks like it's worth checking with your local store. Let us know what you think, especially if you're an iPad 3 owner, in the comments section below.